Chen Si believes in a certain ‘live-no-matter-what-personal-horrors-one-encounters’ ethos. It’s a good dose of individual responsibility mixed with the Communist philosophy that to commit suicide is as much a personal tragedy as a move against the state. Not that one would expect anything less from the actual angel of Angel of Nanjing, as he mans his weekend post, attempting to talk people down, in some cases even grab them off the ledge, before jumping to their death off The Yangtze River Bridge in China. This is an interesting documentary to say the least, both about the most popular spot in the world to commit suicide from, as the characters we meet along the way (men and women saved by Chen, brought out for a meal, housed in an apartment he rents for the purpose of getting distraught folks on their feet again). We are treated to beautiful landscape shots of the region (there are as many gorgeous day and night scenes of the bridge and Yangtze river) as the urban bursting-at-the-seams chaos where Chen lives. But when you meet the folks ready to jump, the anguish we read on their faces really cuts you to the core; this is the heart of the movie I feel, the ‘why’ we get so desperate. And while Angel of Nanjing presents a heartbreaking peak at on-the-bridge confrontations between Chen and would-be jumpers, to see Chen ‘up there’ weekend after weekend (he has been at saving people’s lives now for over a decade, having stopped hundreds of people from jumping) makes you certainly believe in angels. 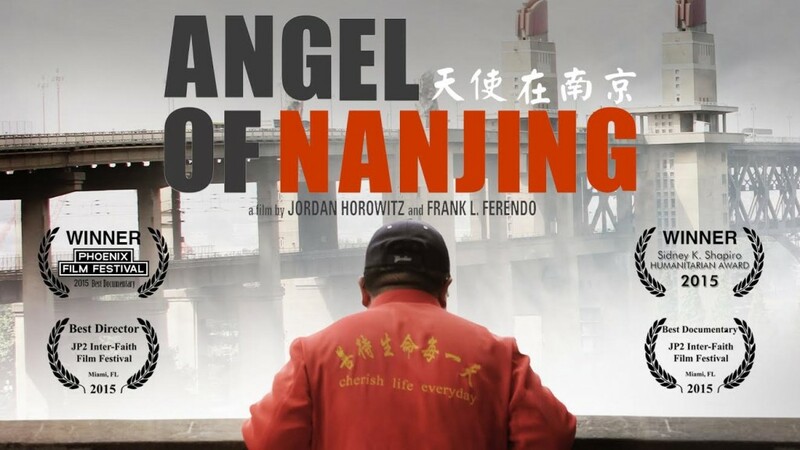 The Angel of Nanjing is available on iTunes, Vimeo, and Google Play.